Wish I could claim the credit for this one but it was all Chef Cotte. The final exam for the second of three courses in my program at LCB is this Saturday, so to prepare I have studiously been going over all my notes and photos. A couple weeks ago the chefs gave us a list of ten recipes we've worked with throughout Intermediate, but only one of which we are expected to make in under three hours on exam day. And we won't know which one until the day of! Fun, right?? When I look back on Intermediate Pâtisserie I will probably remember it as the time that I had to prepare a great many mousses, creams and dacquoises by hand (read: lots and lots of whisking). I'm not really sure why they make us do this, because even in demos the chefs will say that no one actually does this in real life - in professional kitchens they use machines. I suppose they think that it builds character or something. Muscle tone, maybe? I always make sure to switch hands periodically lest I end up looking like tennis player Rafael Nadal. Thanks to a fellow classmate misinforming us that the pastry cream called for six leaves of gelatin (rather than six grams, which is only three leaves), several students ended up with a mixture that had the approximate consistency of cottage cheese. Not ideal for filling the delicate shells. Chef also wasn't pleased that my macaroons were not of uniform size; trust me, piping is harder than it looks. But they still tasted good! This Frenchified strawberry shortcake is probably one of my favorite recipes. Strawberries and mousseline cream sit between two layers of genoise sponge cake, which is topped with toasted Italian meringue and fresh fruit. My puff pastry base topped with fromage blanc, apricots and streusel was ruined when I placed it in the broken oven, which was mostly disappointing because I was looking forward to eating it after class. However since I failed at crimping the edge of the pastry in an attractive manner, maybe it's better that chef gave me a pity grade of 3/5. Whereas in Basic the only fruit we got to work with was apple, Intermediate had us using some more exotic flavors. 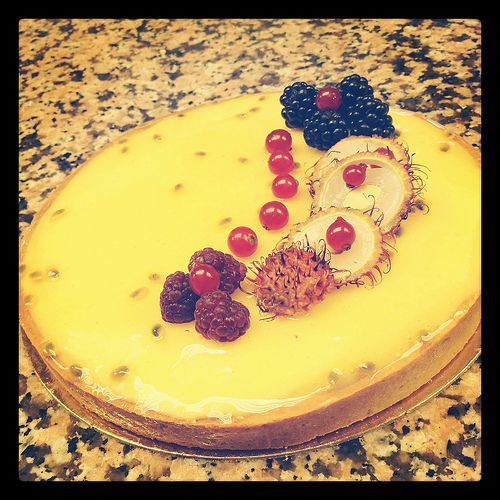 After blind baking, the tart shell is filled with a layer of raspberry coulis before being topped with passion fruit cream and neutral glaze. A chocolate joconde biscuit flavored with coconut, almonds and pistachio surrounds a bottom layer of coconut mousse with poached pineapple, topped with a nice mango-passion fruit mousse. 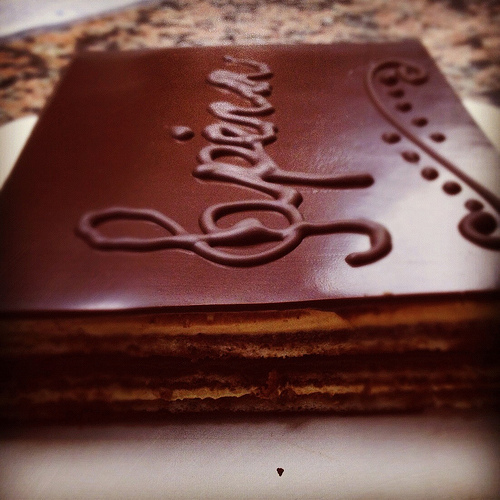 The dreaded Opera cake is right up there with brioche in terms of things I love to eat but hate to make. It consists of thin layers of cake imbibed with coffee syrup, coffee buttercream and chocolate. Delicious, yes, but an absolute pain in the kitchen because there are so many steps. Naturally this is one of the potential exam recipes. Part two of a series of lessons on tempering chocolate, the process of melting, cooling and reheating the substance to specific temperatures in order to achieve a final product that sets quickly, looks shiny and breaks evenly. It's not hard, but requires a lot of patience. The truffles are dark chocolate rolled in white and then coated with cocoa powder. The square ones are marzipan flavored with coffee extract, then dipped in white chocolate and decorated with dark. Lady finger sponge cake serves as the base for three layers of chocolate Bavarian cream: dark, milk and white. Topped with chocolate glaze and white chocolate decoration. The gelatin in the Bavarian cream recipe gave the chocolate layers a thick, custardy consistency that I didn't particularly care for (I prefer mousse) but it's still a nice cake. Chocolate on chocolate mousse on hazelnut dacquoise. Need I say more? The hardest part is not over-beating the mousse. As you can see mine is starting to fall apart. Chef was not pleased. 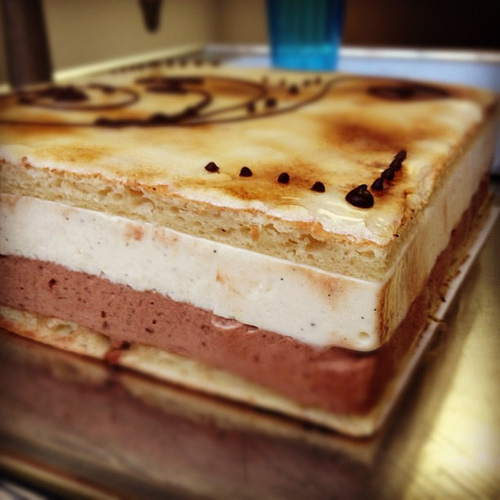 Chocolate mousse and vanilla supreme are sandwiched between two layers of Joconde sponge cake. The top is a caramelized egg yolk and sugar mixture with glaze smoothed over it. What I remember most about this cake is thinking how much more annoying it is to work with square molds than round ones. Probably one of the yummier things we've made, and almost certainly the only time we'll be incorporating meat - chorizo, cocktail sausages, ground pork - in the recipe. We also used inverted puff pastry, which is exactly what it sounds like; you combine the dry butter with a bit of flour and fold the détrempe dough up inside of it. After the first turn it feels pretty much the same as normal puff pastry. I loved the flavors in this cake - almond dacquoise base, wild strawberry mousse and vanilla Chiboust cream - but the shape isn't terribly appetizing, IMO. I've never had a Baked Alaska, but I would imagine it's something like this. Since I'm not a huge fan of chestnuts, I found the chestnut mousse and cream to be a little off-putting. Why couldn't we have used chocolate instead? A coconut dacquoise base with passion fruit cream, raspberry mousse and glaze. The Jackson Pollock effect on the side is achieved by dyeing a small portion of cigarette batter two different colors, piping squiggles on a piece of parchment paper, freezing it, and spreading the Joconde sponge batter over it before baking. The dominant flavor in this cake comes from the caramel base that is used in the imbibing syrup, mousse and glaze. Cooking it to the correct color is daunting; too dark and it will taste bitter, but too light and it won't look good. Chef didn't offer much helpful advice regarding when to remove the caramel from the burner...sort of like when you're rolling out dough for a tart and all they say is, "Not too thick, not too thin." Chefs just have a sixth sense for these things, I guess. The practical so labor-intensive it had to be split into two classes. On day one we prepared the nougatine base (basically sugar cooked to caramel stage with almonds folded in at the end). Nougatine hardens as it cools, so the only way to mold and cut it is when it's hot. Chef had heat-proof gloves when he prepared it in demo; we just used our bare hands. Many burnt fingers ensued. Day two consisted of preparing the cream puffs: first baking the choux pastry, filling them with pastry cream, and finally dipping them in caramel. (Read: more burnt fingers). Putting the final cone together is challenging since there's no mold or anything inside to guide you; it's up to you to attach the cream puffs together (using more caramel) in a way that looks even from all sides. Last practical: introduction to bread-baking. It seemed a lot easier than when we made brioche in Basic, but then again chef did a lot of the work as far as putting our dough in the oven and proofing box so that it would rise quickly enough to finish baking everything in two hours. I'm still a little sick of baguettes from when I went to Cannes in May and ate nothing but sandwiches for ten days straight, but the sandwich bread was delicious.